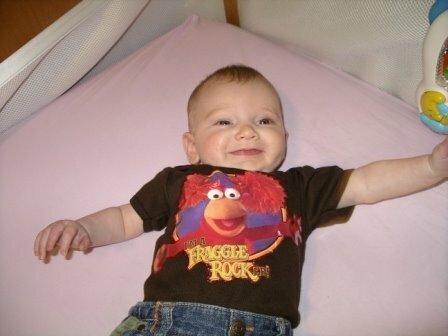 Fraggle Rock was one of my favorite shows growing up. Last year for my birthday my parents bought me the first season DVD of Fraggle Rock. A few months ago I found a Fraggle Rock t-shirt and then Friday night my sister-in-law gave Little Bo Peep this shirt that she bought from The Retro Baby. Now when Little Bo Peep and I watch the Fraggles we can wear our Fraggle Rock shirts!